2.1 Channel: enjoy a dynamic home audio experience with surround sound. 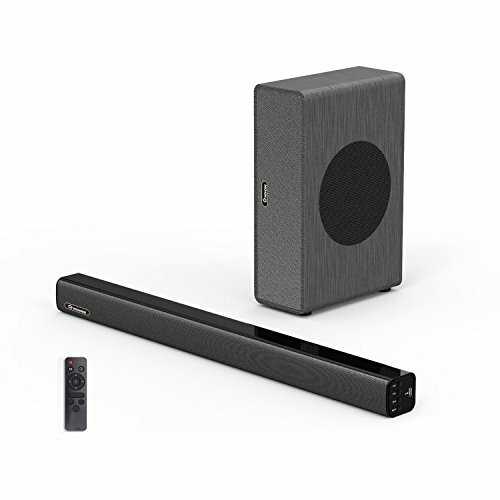 Powerful Soundbar: come with a 40W wired subwoofer and a 40W soundbar speakers, output 85dB expansive and crystal-clear sound, adds rich bass to your movies, TV shows, videos, and music. Wired and Wireless Connection: pair via Bluetooth 4.0 from up to 33 ft, lets you enjoy high-quality audio and lose wires; or choose wired connection including RCA/USB/coaxial/optical inputs, what's more, optical/RCA cables provided. 100% Satisfaction Service: we offer one year warranty, 45 days money back guarantee, lifetime technical support, please feel free to contact us via Amazon message or support mail on the service card. If you have any questions about this product by WOHOME, contact us by completing and submitting the form below. If you are looking for a specif part number, please include it with your message.